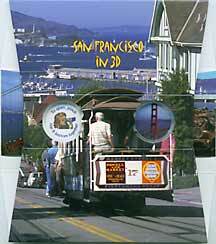 Cockeyed Creations San Francisco in Stereo 3-D Photography Oh Wow! On a day when two America's Cup contenders were battling for the Moet Cup, the bay is filled with the huge contenders Alinghi and Oracle and their various "chase boats." 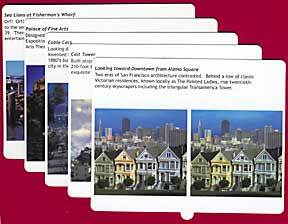 We've packed this card with six classic views of the City By the Bay! The inside view shows the Golden Gate Bridge from the Marin Headlands, late one Sunday afternoon as a giant cruise ship passes under the bridge. The caption comes from a bronze plaque affixed to the south tower when the bridge was completed in 1937. Oh Wow! 3D gift card. A little nub at the bottom of the card fits into a convenient slot on the bottom, to hold the card in place.